Our business cards are normally printed on smooth or silk 300-350gsm* card in full colour or black only. The cards can be printed with a white border or to the edge e.g. with a photograph or colour background. *350gsm is a relatively medium weight card for business cards - specialist printers may use 450gsm - however we cannot print onto anything heavier. Our cards may be slightly lighter weight, however, they are usually cheaper and take less time to print. If this is of particular concern to yourself, please call in to see a sample before placing an order. Prices do not include a design charge. 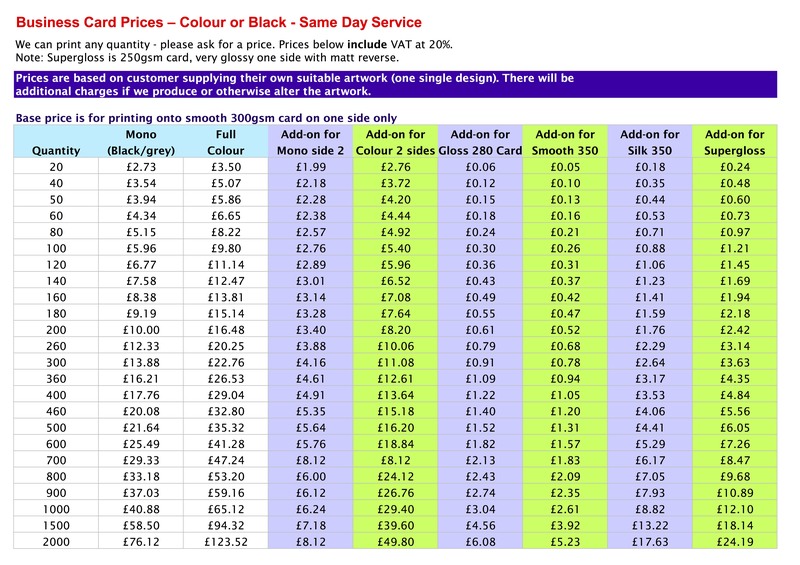 The prices below assume that the customer supplies correct, finished artwork in a suitable format. If you require something more complicated, then the price may increase. If you want us to also design your card, additional charges (minimum £6.00) will apply. Prices include VAT at 20%. If you require a different quantity or have any questions, please ask us for a quotation. If you want a card in any other size than 85mm x 55mm then we will need to produce a new template which will cost extra. Our finished card size is 85mm wide by 54mm high. If you are making cards with a white border, please ensure everything fits within a 2.5mm border i.e. maximum size of 80mm x 49mm. If you want cards printed to the edge, then you need to provide a bleed of 5mm to allow for any shifting. This will be cut off the finished card so it should not be anything you must have. Also ensure that all important information on the card fits within a 2.5mm border of the finished size. See sample picture below. Vector/Non-bitmap Artwork: Vector artwork, as created with programs like Adobe Illustrator and Macromedia FreeHand, generally gives better results than bitmap artwork (e.g. from Adobe Photoshop) especially if the image has to be scaled larger. The best format to supply artwork in is EPS - Encapsulated PostScript, with a Mac preview. If this is not possible, the next best vector format is PDF (Acrobat) as we are (usually) able to convert this to EPS. Ensure all fonts and any graphics are embedded within the EPS or PDF file for maximum compatibility. See this page for an explanation of the two types of file. Bitmap Artwork:If you cannot supply vector artwork, we can also accept a wide range of bitmap formats. Please use a minimum of 300dpi up to a maximum of 600dpi at the actual printed size. For best results, we recommend that you save in a non-lossy format such as TIFF, Adobe PhotoShop or Windows Bitmap rather than JPEG. We can, of course, use JPEG, but you may well get better results from a different bitmap format. N.B. If you use Adobe PhotoShop, please flatten the image before sending it to us. More information on file formats and how to make PDFs for free can be found on our file formats page. We can make cards from programs such as Word or PowerPoint but bear in mind that we may not have any non-standard fonts that you use. When we print and cut the cards, there may be a small amount of shift. To ensure that your background image prints to the edge on each card (i.e. no white bits), you need to produce an image that is larger than the finished card size, that is 95 x 64mm (to the red line in the image below). We then cut 5mm off each edge to give you a finished card size of 85 x 54mm. Any text and important elements of the card's design must be kept at least 2.5mm inside the finished edge of the card (inside the blue line in the image below). You may find it helpful to print this guide which shows the required dimensions for a business card with printing to the edge.